Haws Corporation reflects its commitment to sustainable products with Heritage Service, available to owners of vintage Haws drinking fountains who need technical support to renovate 40-year-old-and-older installations. Owners who want to retain the charm of their antique fountains while updating mechanicals to meet current codes and operating efficiencies now have help. Pictured is a 1930s brochure photo showing a young Terry R. Haws drinking from a Haws Model 12A fountain. 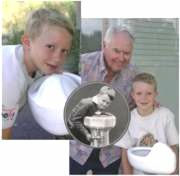 The recent photo shows a now-retired Terry R. Haws and grandson, Terry Haws Van Tassel, with a Model 6G fountain, popular from the late 1920s through early 1950s. Tour Links now offers Mini LinksTM , a modular miniature golf course that's a spin-off of the Tour Links© practice putting greens. The low-priced unit is completely mobile, allowing one person to assemble it in minutes. The framework for each golf hole consists of compression molded plastic grid made from 100-percent-recycled TPO, providing a solid surface and natural feel. Interlocking panels provide extra strength and level alignment. Panels weigh an average of seven pounds and are easily shipped and stored. 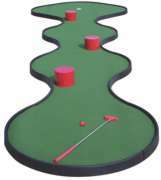 The holes vary in length from 18 feet to 24 feet and have a variety of playing shapes. 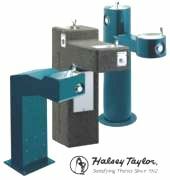 Halsey Taylor's popular line of freeze-resistant drinking fountains has been expanded to include a variety of models with an ultra sanitary freeze-resistant valve system. Like its standard freeze-resistant models, these systems are designed for ground installation 18 inches below the frost line. The valve system is fully sealed, meaning the chance of groundwater contamination is minimal and it prevents drain water from mixing with fresh water. The Sanitary Freeze-Resistant options include pedestal models from their Endura II Tubular, EnduraTM Steel and SierraTM Stone families. Most models meet ADA requirements. Vandal-resistant features and durable finishes provide year-round beauty and performance. Elite fence systems are preferred when an application requires superior security, good looks and durability. Elite double wire panels are made of 4-gauge steel wire consisting of one vertical wire sandwiched by two horizontal wires and welded at each intersection making a 2-inch-by-8-inch opening mesh for a secure, rigid panel. All panels are galvanized and polyester powder-coated. Standard Change-Makers, Inc., a leading manufacturer of currency change machines, has added its redesigned "Rhino" high-security, front-load changers to its Modular Series. The MC700 "Rhino" includes one Pyramid Technologies© APEX-5000 Series Bill Validator and one Standard High-Capacity Modular Hopper with 4,200-quarter capacity ($1,050). The MC720-DA features two Bill Validators and two Standard Modular Series Hoppers with 6,400-quarter capacity total. Both have High Security Cabinets made of 10-gauge solid welded steel, with an 8-gauge door and hidden-hinge design. The cabinet door has two "T"-Handle Slam Locks with AceTM plugs, upgradable to Crank Locks with MedecoTM plugs. The next generation Falcon Waterfree Technologies urinal cartridges deliver significant performance improvements in challenging conditions. 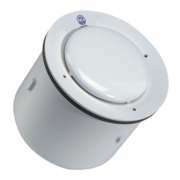 The updated design features a special shield that regulates flow, resulting in more durable cartridge life where conditions require a resilient solution. Customers may notice a change in the appearance of the cartridge, but the updated design is 100-percent compatible with all Falcon urinals, and the cost is the same. The proprietary cartridge is the heart of the Falcon Waterfree urinal system, which is hygienic, touch-free and odor-free. Falcon Waterfree Technologies is a world leader for zero-water consumption urinals.